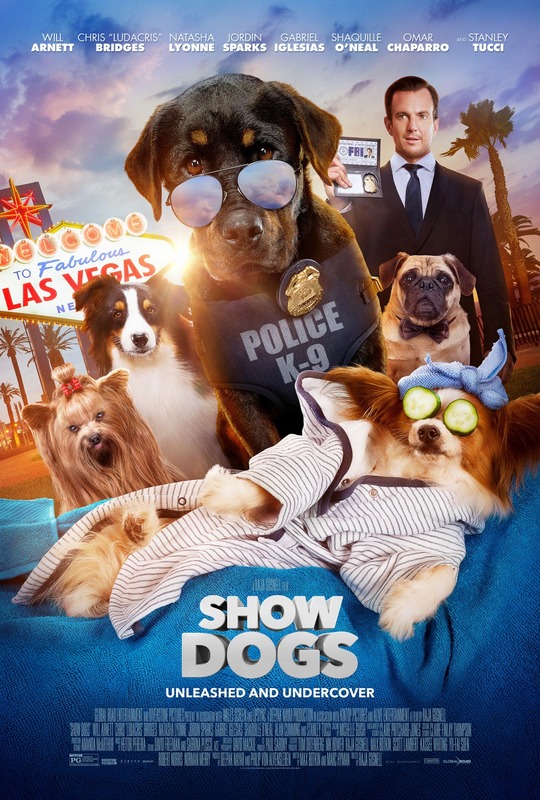 An FBI agent and an NYPD police dog are forced to team up and go undercover at a dog show in Las Vegas to find out the identity of a panda smuggler. If the phrase 'from the makers of "Beverly Hills Chihuahua"' doesn't get you excited to see "Show Dogs," nothing will. We really mean that literally, nothing will. This "movie" is directed by Raja Gosnell, who has directed other "films" like "Home Alone 3," "Scooby-Doo" one and two, "The Smurfs" one and two, and the aforementioned "Beverly Hills Chihuahua." Needless to say, he has a lot of experience with talking dog "movies." This "movie" is written by Max Botkin, who was a writer on the film "What Happened to Monday," and Marc Hymen, who wrote "Osmosis Jones." It stars Will Arnett as FBI agent Frank, who is working on a stolen panda case. He is forced to team up with a New York K-9 cop named Max (Ludacris) and go undercover at a dog show competition in Las Vegas where they believe the panda thief will attempt to sell the baby panda he stole. When we saw the trailer for this "movie," we sat silently in our seats with our mouths wide opened. A "movie" like this could not possibly be released in the year 2018, right? Wrong. It's as if the producers thought to themselves: "what if we took the buddy cop scenario from 80's movies like "Turner and Hooch" and "K-9" and mixed it with the talking animal technology from "Cats & Dogs" and "Beverly Hills Chihuahua" from the 2000s? 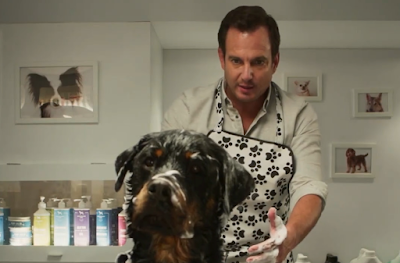 It will star Gob Bluth, aka the voice of Lego Batman, the prison inmate from "Orange is the New Black," and the rapper from "The Fast and the Furious" franchise. It can't possibly fail!" It does. It did. It will always fail. If you assumed this "movie" was going to be dumb, you will not be shocked to discover that it is unbelievably stupid. Words cannot describe how painful it was to watch "Show Dogs." Many of the jokes involve standard kid's movie fodder and is ripe with toilet humor. Dogs fart constantly, there are jokes about pooping, and there are many innuendos and double entendres thrown in as well, one of which is more disturbing and unnecessary than others. There's a bit of self-aware humor that steps into meta territory as the "script" references Arnett's role as Lego Batman and the fact that Max is voiced by Ludacris. There's also a "Beverly Hills Chihuahua" reference and cameo, as well as a nod to "The Lady and the Tramp." There's a running gag about how it rules to be alpha and that there's no better way to be. We're sure Max wearing a MAGA hat will happen in the "sequel." Let's get back to the disturbing joke for a minute. This is in reference to a running gag about how Max must learn to accept being grabbed by the private parts and go to find his "zen/happy place" so he doesn't react poorly so he can win Best in Show. Yep, fondling a dog's balls is a major plot point of this "movie." Many articles have been recently written about the sinister meaning of this content. We fully understand that it's actually part of the dog show process to do this to animals in competition, but our question is, why not just change the content of the story to make it more family-friendly and avoid any potential controversy? Let's face it, it's not as if this "movie" is striving for accuracy. THERE ARE TALKING DOGS, FOR CRYING OUT LOUD. It's almost as if this running joke was left in the movie to drum up online chatter to get more people to see the "film." Beyond these things, the rest of the humor in this "flick" involves sight gags about how the dogs aren't acting like canines since as they are given humanistic qualities. Just to make it clear, unlike some online summaries imply, this is not an alternate universe with anthropomorphic dogs that talk to humans. Dogs are still dogs and they only speak to other animals like they do in "Look Who's Talking Now" or "Homeward Bound," just with terribly CGI'edfaces. "Show Dogs" is absolute trash. With that being said, this "movie" is so stupid that BigJ did wind up laughing, not at any of the jokes, more in an "Oh my god, I can't believe this got made" kind of way. This is a "movie" some kids will love when they are younger, but when they grow up, they will realize it is unconditionally horrible and will be forced to apologize to their parents for making them see it. This movie only gets points for the adorable looking dogs. And we think Show Dogs is Bad, God Help Us. We are glad you liked this movie! Unfortunately, we found it to be one of the worst films of the year. We don't have kids, but we will certainly take a stand for them by letting them choose who they want to be and allowing them the freedom to do what they want to do with their lives and loving them regardless of their choices. We will admit, we think it is a massive leap to compare this kid's movie to something much more serious like abortion, but hey, that's just us. Have a great weekend!